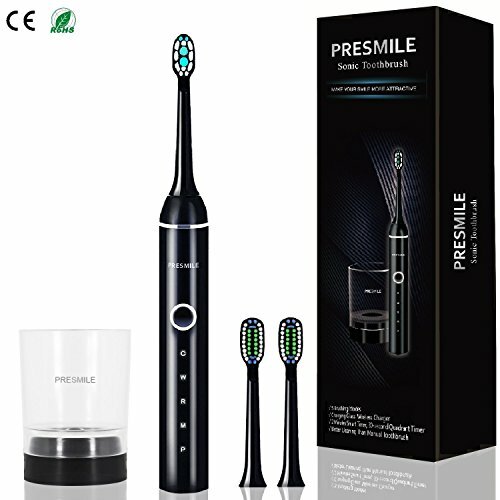 【Completely Remove Plaque】 Presmile Sonic Toothbrush- High Sonic Vibration 31,000 Rotations per Minute - tackle trouble spots and hard-to-reach areas and power away up to 350% more plaque along the gum line. At the same time, the vibration of the bristles oral perfusion, gum tissue can promote unexpected massaging effect. After two minutes of brushing with this, it leaves you with a fresh feeling mouth. 【Low Decibel & Long Lifespan】Use of high-frequency bass technology to reduce vibration noise below 45 decibels. Manufactured by ABS / HAHL PEDEX Bristle, with a life of up to 4 years, effectively prevents machine breakdown caused by dropping or bumping. 【Wireless Induction Charging】Enjoy the regular use of a single full charge for up to 30 days, no need to replace the battery. Innovative Charging Glass for charging the Sonic Toothbrush by induction. To recharge place the toothbrush in the charging base using your laptop via USB or plug it into a wall outlet for convenient charging on-the-go! 【Improve Gum Health】Five Health Modes for a good cleaning experience: Clean, Whiten, Relieve, Massage, Power. Improves gum health in only two weeks. 2-Minute Timer 4-Quadrant Timer. In-handle timer pulses every 30 seconds to let you know when to switch areas of the mouth. *Whitening health bristles to reach deep between teeth to lift and power away up to 350%. *Sensitive soft bristles to avoid abrasion to teeth, enamel and gums.